Showplace for Northern Nevada casino chips and Sarah's Hard Rock Collection too! This link, above and to the left, is the best way to find specific chips or types of chips. 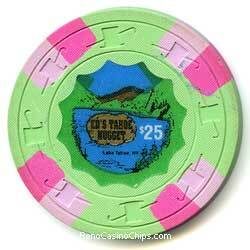 For example, you can find all commemorative chips in Reno, all $1 house chips, only chips that are for sale, etc. Browse and search results are presented at 50 chips per page. 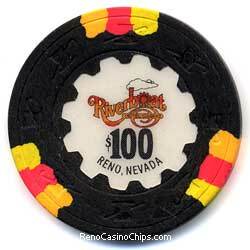 Chips are displayed by casino, then in category order of House, No Cash Value, Roulette, and Commemorative. Within categories, chips are sorted by denomination then date, except in Commemorative where chips are sorted by date then denomination. Chips are organized by year of issue. You can also check out the newest issues, and learn how my New Issues Service works. The Specific Themes link takes you to chip collections grouped by specific themes. 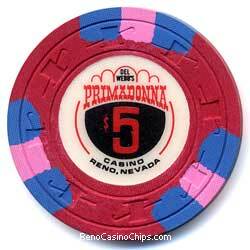 Here you will find chips organized by events such as the Reno Air Races and Hot August Nights. I have many duplicates available for sale or trade. This is indicated in the Gallery to the right of the chip picture. If the chip is in stock, the price is also listed. In the Search dialog, you can include In Stock as a search criterion. Someday I will have a fancy shopping cart like everyone else. In the meantime, just send an email to Larry@RenoCasinoChips.com listing the chips and quantities you are interested in. Please note! The chip pictured is usually NOT the exact chip you will receive. Most chips will be in similar condition to the one pictured. Recent Issue chips are usually in new or slightly used condition. Please ask on the older chips if you are concerned about condition. Quantity prices are available. Shipping is $3.00 per package for US Domestic First Class mail, $6 for US Domestic Priority mail. Insurance is available at cost, based on value. I am not responsible for uninsured packages. Foreign shipping is at cost, and insurance may not be available. I accept PayPal at Larry@RenoCasinoChips.com, or check or money order to the following address. Casino images courtesy Mark Englebretson. Check out his Nevada Casino Ashtray Project at www.nevadacasinoashtrays.org!